Venus Transit 2004: A Tremendous Success! The Venus transit was without any doubt a resounding success. Reports received testify to an extremely large numbers of public events spread over all continents and it appears that even the VT-2004 National Nodes are struggling to get the full picture in their own area. There are several indicators of this trend, the most obvious one being perhaps the number of Web hits. Following the record impact of the Mercury transit last year, the present one was more than ten times higher, with more than 54 millions hits on the VT-2004 website and 1.75 terabytes of data delivered during an 8-hour interval, covering the transit period. Thanks to good preparation, the VT-2004 website with its hundreds of Akamai mirrors did not suffer the fate of several smaller servers which collapsed under the load as was reported in the news. Another way to measure the big success of the Venus transit is the number of images which have appeared on many web sites: those from the members of the VT-2004 Network, the listed webcast sites, the websites linked directly from the National Nodes pages, etc. 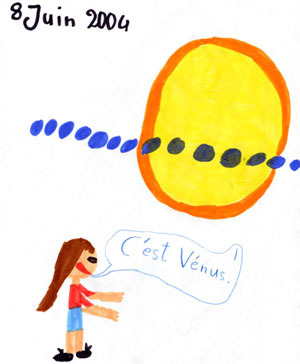 Particularly welcome has been the large number of drawings made by children who witnessed the Venus transit. These drawings are now deposited at the VT-2004 Gallery and come from many different places, including, e.g., the Czech Republic, Luxembourg, Greece, Hungary, Portugal, Slovenia or the United States. All drawings entered into the Gallery before June 30 will have a chance to win one of 25 unique VT-2004 T-shirts. And apart from photos or drawings, the event has also inspired poetic expression and a new section has been opened on the VT-2004 web site. Another feature of the VT-2004 web site is the archive of the Central Display which ran live for the full duration of the celestial event with many timely photos and comments from professional astronomers. Anybody who was unable to follow this, can still see the evolution of the Central Display in this comprehensive archive. An additional aspect of the VT-2004 programme, the real-time measurement of the Astronomical Unit - that is, the mean distance between the Earth to the Sun - was also a great success. More than 2500 observing teams have registered and at this date, almost 1300 have already entered their observations of the times of the contacts, with a total of 3700 timings so far. This exceptional enterprise - a coordination of a large number of telescopes and instruments all over the world - has never been attempted before and proved very successful. During the event, and after, a real-time display showed the measured astronomical unit as more data came in. As could be expected, some contacts were easier to measure than others, and in particular, the data concerning the first contact were rather far off and the computed AU-value fluctuated as more and more observations were entered in the database. In retrospect, it appears that some observers posted their first contact measurements as if they corresponded to the third contact, making the dispersion larger than it really was. As soon as the second contact was measured, the measurement of the astronomical unit stabilized pretty close to the real value, 149.6 million km, with a dispersion of about 2 million km. It is perhaps somewhat surprising that the obtained value is so close to the real one, therefore largely beating the uncertainty which plagued historical measurements of this fundamental unit. One reason is most certainly that in order to ensure maximum stability in this real-time calculation, it was necessary to introduce - for this particular phase of the project - scientifically more rigorous computations, within which it was assumed that the initial value of the astronomical unit was not too far from the real one. This rigorous mathematical method apparently stabilized the solution faster than anybody expected. In a next phase, a solution according to Delisle's or Halley's method will soon be attempted once more timings have been received. This will reflect in a more realistic way the errors by individual observers. Further calculations will include the determination of the size of the Sun, of the size of Venus, etc. by means of other algorithms. This will allow gaining a complete picture of the characteristics of this large and absolutely unique database collected during this exceptional exercise. Observers have still until July 10, 2004 to send in their timings in the VT-2004 database. A database which will also soon be opened for everybody to use and apply their own tools or methods. Finally, if the Venus transit is over, the VT-2004 programme isn't, and by far. Apart from the living photo, drawing, writing and music galleries, a video contest is being launched. In this, members of the public - either as individuals or in teams - are invited to present a video of maximum 8 minutes (in any European language but with an English transcript of the manuscript) in connection with the Transit of Venus on June 8, 2004. The video could either present the astronomical event, the local event that was witnessed, including preparations for the observations, reactions of participants and on-lookers,... or it could try to demonstrate sociological or historical aspects, or wider scientific or philosophical issues, etc. From all the entries received, an international Jury will select 12 laureate videos which will be shown during the VT-2004 Final Event, to take place in November 5-7, 2004 in central Paris (France), and made available to the media. Two members of each laureate team will be invited to this Final Event, during which the Jury will award the prizes. The first prize of the video contest is a free trip for two to the ESO Paranal Observatory in Chile. The VT-2004 organisers have already received many expressions of interest in this contest from different places. 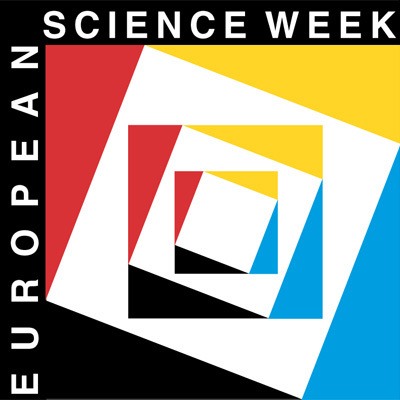 The Final Event, which will take place during the European Science Week, will be a true encounter between Science and Society during which the VT-2004 programme and the public impact of the Venus Transit will be discussed. No doubt this pilot project will serve as a very useful guide to future ones whenever opportunities again present themselves.